If you live around Denver and would like your order delivered fast, find us on UBEREATS, GrubHub, or DoorDash. You can also order right here with the big red button for pick-up or shipping. Order your own special primal pies and cakes for pick up! Just click the links below for more information. 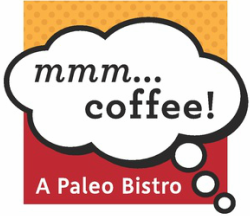 The Paleo Diet has nourished civilization since the dawn of time. Since the agricultural era began 10,000 years ago, humans have slowly moved away from the obvious food choices in favor of convenience, habit, and price. But processed, altered, preserved foods and super-sized, concentrated sweets have proven themselves poor substitutes for sustenance. Now, an ever growing segment of society is rising up against these poisons and taking back their health by rejecting fake foods and seeking out the very highest quality ingredients. Our cookies, brownies, muffins, and granola are all made from scratch in house, always Gluten- and Grain-Free and naturally sweetened. Organic Fair-Trade Espresso is lovingly prepared and served in a way that highlights the best characteristics of the coffee. We use organic vegetables and free-range, grass-fed, or wild caught meats and eggs in our fresh made soups, salads and savories.